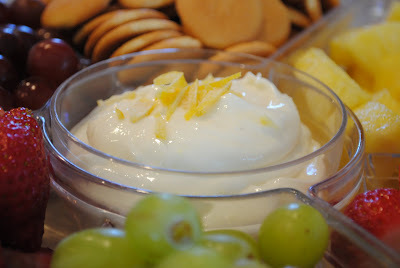 This is a slightly more grown-up version of the popular cream cheese and marshmallow fluff fruit dip. But it still only has four ingredients and is ready in about five minutes. I think it works as an appetizer, a light dessert or goes well with a brunch menu. 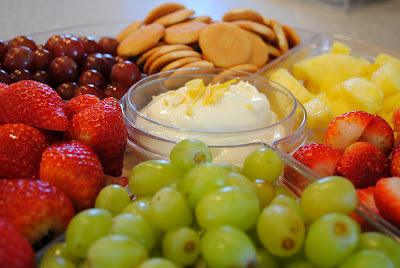 Its perfect with all kinds of fruit; my favorites are strawberries, pineapple, and grapes. You can also add some vanilla wafers or other cookies to the platter. And it's perfect for making a vanilla wafer sandwich - kids will love them - just sandwich a strawberry slice and a spoonful of dip between two vanilla wafers. Beat cream cheese until light and smooth. Add in yogurt, lemon juice and zest (reserving a little for garnish if desired) and beat until smooth. Slowly mix in powdered sugar. Keep refrigerated until ready to serve. That's gorgeous! It looks very fresh! Are you going to post some Easter brunch/dinner recipes? I need some awesome ideas! I just made this, as I had recently found it on Pinterest, and OH MY GOD IT IS SOOO GOOD!!!! Thank you for this wonderful recipe. I've just made the dip, it was awesome, thank you! Followed the recipe and it came out runny. I'm hoping if I add whipped cream I'll be able to salvage it because it looks like soup right now but tastes good.